Quick is a behavior-driven development framework for Swift and Objective-C. Inspired by RSpec, Specta, and Ginkgo. Quick uses a special syntax to define examples and example groups. Examples, defined with the it function, use assertions to demonstrate how code should behave. These are like "tests" in XCTest. Example groups are logical groupings of examples. Example groups can share setup and teardown code. Example groups don't just make the examples clearer, they're also useful for sharing setup and teardown code among examples in a group. Sharing setup like this might not seem like a big deal with the dolphin example, but for more complicated objects, it saves a lot of typing! To execute code after each example, use afterEach. Dolphins use clicks for echolocation. When they approach something particularly interesting to them, they release a series of clicks in order to get a better idea of what it is. The tests need to show that the click method behaves differently in different circumstances. Normally, the dolphin just clicks once. But when the dolphin is close to something interesting, it clicks several times. For examples that don't pass yet, use pending. Pending examples are not run, but are printed out along with the test results. // ...none of the code in this closure will be run. Some test setup needs to be performed before any examples are run. For these cases, use beforeSuite and afterSuite. You can specify as many beforeSuite and afterSuite as you like. All beforeSuite closures will be executed before any tests run, and all afterSuite closures will be executed after all the tests are finished. There is no guarantee as to what order these closures will be executed in. In some cases, the same set of specifications apply to multiple objects. For example, consider a protocol called Edible. When a dolphin eats something Edible, the dolphin becomes happy. Mackerel and Cod are both edible. Quick allows you to easily test that a dolphin is happy to eat either one. Shared examples can include any number of it, context, and describe blocks. They save a lot of typing when running the same tests against several different kinds of objects. Quick works equally well in both Swift and Objective-C.
You must define the QUICK_DISABLE_SHORT_SYNTAX macro before importing the Quick header. Quick provides an easy language to define examples and example groups. Within those examples, Nimble provides a simple language to define expectations--that is, to assert that code behaves a certain way, and to display a test failure if it doesn't. You can find much more detailed documentation on Nimble, including a full set of available matchers and details on how to perform asynchronous tests, in the project's README. // Accessing the view property causes the UIKit framework to trigger the necessary methods to render the view. This module is beta software, it currently supports Xcode 6 Beta 4. Quick provides the syntax to define examples and example groups. Nimble provides the expect(...).to assertion syntax. You may use either one, or both, in your tests. Example projects with this complete setup is available in the Examples directory. Next, select Quick.xcodeproj, which you downloaded in step 1. 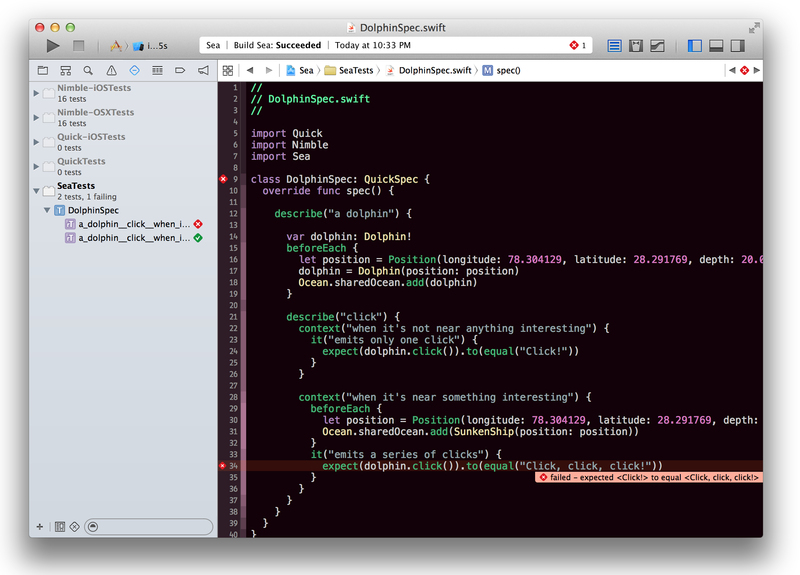 Once you've added the Quick project, you should see it in Xcode's project navigator, grouped with your tests. Follow the same steps for Nimble.xcodeproj. Link the Quick.framework during your test target's Link Binary with Libraries build phase. You should see two Quick.frameworks; one is for OS X, and the other is for iOS. Do the same for the Nimble.framework. If you run into any problems, please file an issue. git commit -m "Updated Quick submodule"
You can read more about Git submodules here. To see examples of Git submodules in action, check out any of the repositories linked to in the "Who Uses Quick" section of this guide. The Quick repository includes file templates for both Swift and Objective-C specs. Quick templates can be installed via Alcatraz, a package manager for Xcode. Just search for the templates from the Package Manager window. Add an issue or tweet if you'd like to be added to this list. Built with MkDocs, using a theme provided by Read the Docs.